Talk face-to-face with loved ones EASILY. 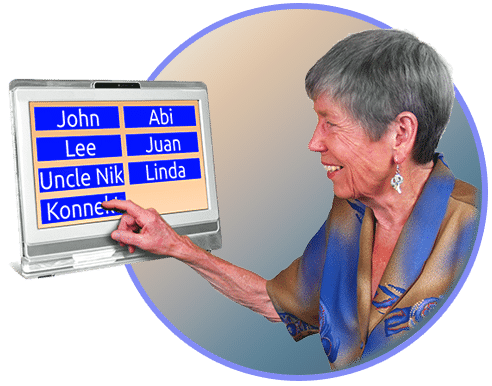 The Konnekt Videophone, a low vision phone for those with poor eyesight, is easy to see and use, thanks to the large 15-inch screen and HUGE (up to 15cm wide) one-touch buttons. The button sizes, text fonts and colours are adjustable so if your vision deteriorates, a quick call to Konnekt is all it takes. There’s no keyboard, mouse or login, and Auto-answer is great for nominated sons, daughters and carers who can’t reach you but would otherwise worry. The Konnekt low-vision phone / video phone is optimised for people who can still see, but have trouble with small buttons. The impressive 38cm screen lets you see your loved ones’ faces, as large as in real life so you can share a smile any time! If you wear glasses but forget to grab them in your rush to answer, no need to worry. Videophone gives you plenty of time to answer. There is a HUGE green Answer button and a red Reject button. There is nothing to pick up or hold. And if you like, we can set it up to automatically answer selected family, friends or care-givers. Big buttons, up to 15cm wide. Huge text. Simple to use. One press to call or answer. No keyboard, mouse or handset. Big 15-inch screen. Ideal for the sight-impaired. High-contrast in a range of colour themes. Personalized layout, fonts, text, colours, sizes. Loud – talk at a distance. Hear it ring from across the home. Rings for up to 2 mins. Plenty of time to find your glasses. Avoid telemarketers. No calls from strangers. We do it all: Setup, personalization, helping your Contacts get onto Skype, even custom installation and Internet in Australia. Face-to-face calls help reduce social isolation. Auto-answer option for trusted carers. Reduce their worry when you can’t answer.